Excellente surprise le nouvel album de NAHTRUNAR ! Darkened Nocturn Slaughtercult 7th album to be released 2018 on War Anthem Records. After releasing a more-than-promising demo in 2015 (also released by IBP), Veiled rise from the shadows of former obscurity with six sprawling tracks of captivating black metal. Featuring Veiled’s new drummer, “Dimman” (Grá, Cursed 13) and bassist Heljarmaðr (Dark Funeral). Recorded at The Grey Studios in Sweden, yet Black Celestial Orbs is as outré as its title suggests. This is “Enshrouded” from Black Celestial Orbs, available March 16th on CD and LP formats from Iron Bonehead Productions. Grift announces his upcoming EP "Vilsna andars boning", due for release on April 6th. The 7 inch comes on black vinyl, includes a A6 booklet and is limited to 500 copies. US residents, get your copy over at Bindrune Recordings. Nouvel album d'ELITISM en écoute. 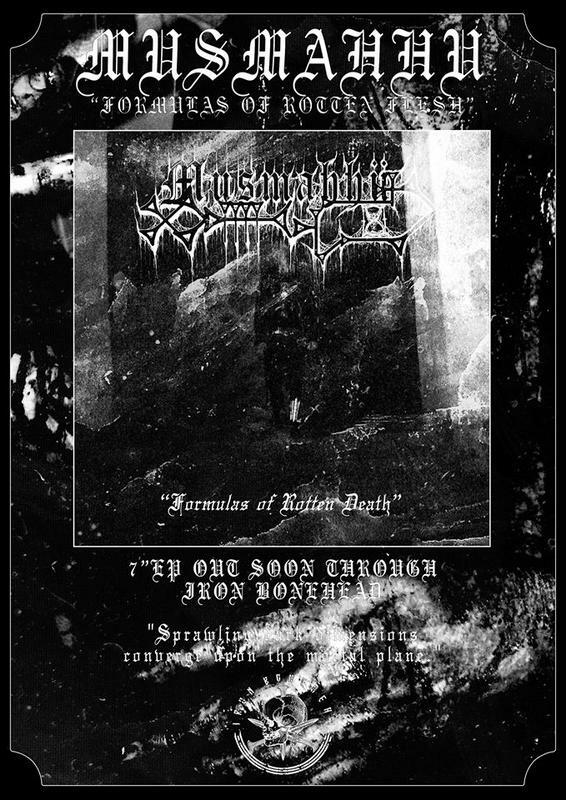 MUSMAHHU - Formulas of Rotten Death 7"EP coming June '18. presenting the purest Metal of Death on this two track 7". The 7" will be limited to 500 copies. Another project is in talks but nothing went to press yet and will for sure take some more time. Excellent extrait du UNGFELL, loin des influences KPN du début. Par contre, le disque est clairement attendu, le vinyle est déjà épuisé. Par contre, ce premier extrait ne me fait pas regretter mon achat à voir si la suite sera aussi bonne. On reste en famille donc. Très bien le titre de UNGFELL, curieux d'entendre la suite. First single from "Patriarchs of Evil" is out. Spread the plague!!!! !